I wrote a post yesterday on Project Nursery about whether or not to get a play kitchen for a boy. My final decision was yes, and to view the whole post click here. This kitchen is by Camden Rose. It is made of 100% real hard wood, no plywood, particle board, paint or fancy colors here. 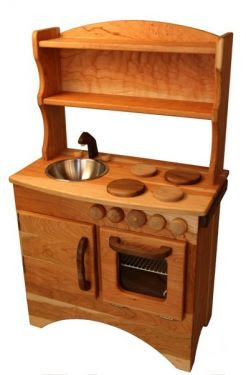 My friend Chelsea likes to call this the ultimate kitchen for the hippie parent. Honestly I really like the old fashioned simplicity which will help a child use their imagination a little more. Plus what could be more neutral than brown wood? I'm sure most of you have seen this kitchen fro Ikea. It is swedish and simple with clean lines and no fuss. At the base price of $99 you really can't go wrong. 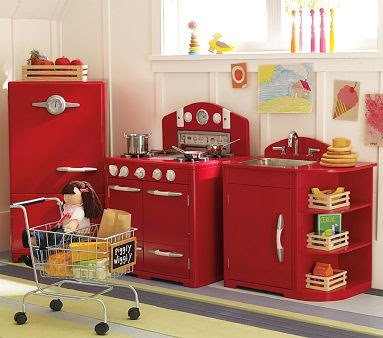 The size is small enough to fit in a child's room and the bright colors of fake food will help brighten up the design. 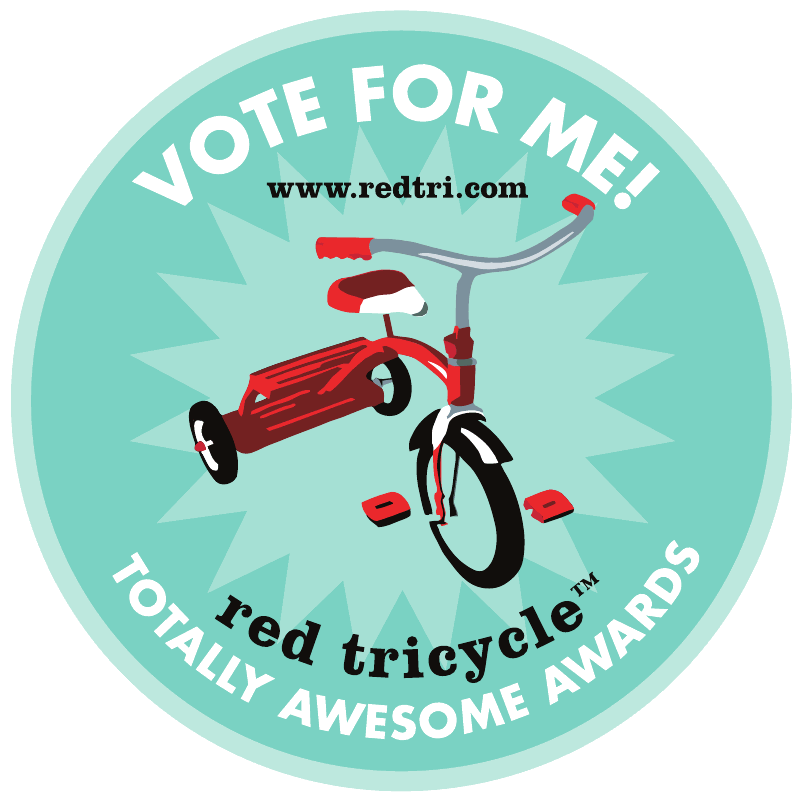 Now if you like red this is a great set from Pottery Barn Kids with a retro twist. The pieces can be purchased individually but are expensive ranging from $500-$700. What I like about his set is that it actually looks nice and is very sturdy. Every Pottery Barn Kids store has a few of these pieces on the floor and they are played with hundreds of kids everyday and still look good. Expensive but built to last. I'm not sure about the quality of this one by Guidecraft because I have not seen it in person, but it looks pretty darn cute. I personally love the unisex turquoise color and like the fact that you don't have to purchase multiple pieces to have the whole kitchen. 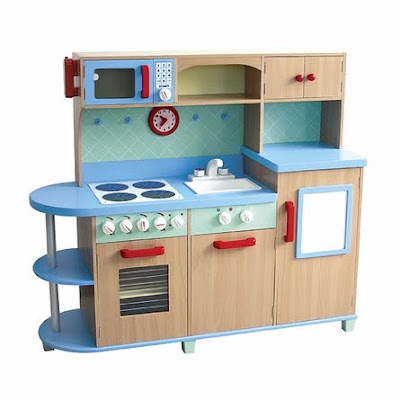 It looks like there is quite a bit of assembly required with this one so parents beware, but if you have the space for a large kitchen like this in your room or playroom this looks like a wonderful choice. 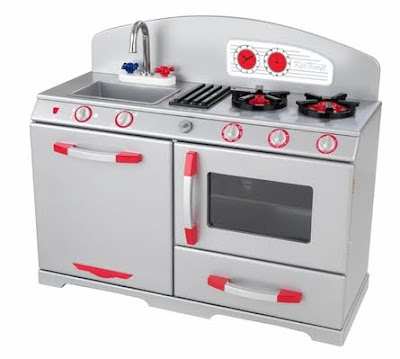 My personal pick (mainly because I am partial to the look of stainless steel) is this one by Kidcraft. I like that it has a low profile so that it can fit under a window and that it does not have a microwave (I personally don't like using them unless I have to). The finish is a high gloss which will help avoid chipping and the size is just big enough so that more than one child can play at a time. After I wrote the post a friend of mine e-mailed me and suggested this wonderful compact unit by Guidecraft. 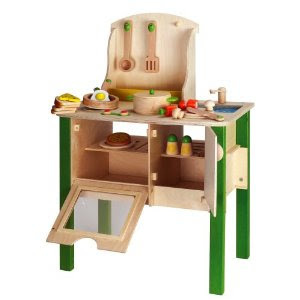 Then a reader on Project Nursery suggested the Educo My Creative Cookery Club by Hape , I just love the simple compact design and the green accents. 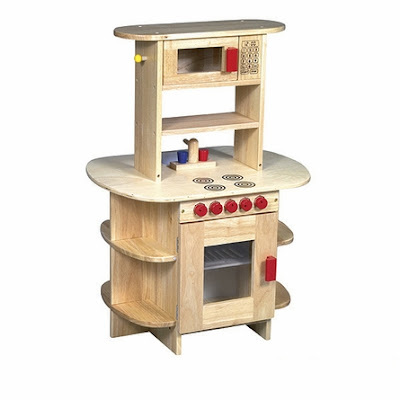 Do you have any play kitchens in your home that you love? I would love to hear your suggestions! Additionally acquiring these is significantly less difficult while they are usually soreness totally free. On this fake rolex hair salon the particular tattoo performers utilize the best quality henna and also shades which can be extremely risk-free for your epidermis. The particular hermes replica offer equally standard along with modern day models which usually actually seem gorgeous around the physique. The particular low-cost additionally dimensions prom attire can be purchased in extended and also quick types, the particular alluring clothes, the particular strapless a single or perhaps the particular basketball outfit. All of it is dependent upon one’s yearning and also just what gucci replica portion a single likes to emphasize vs . usually the one being invisible. The particular go shopping sales person thought can make a difference due to the fact fake rolex submariner is aware which usually types come in vogue and possess a fantastic suit. Furthermore they will realize which usually body type the particular attire seem excellent about.